Depending on how you groom your Maltese, she can look either like an arrogant aristocrat – like a tiny king or queen of the household – or like a playful little rascal who’s only desire in life is to play with you and make you happy. These dogs have become very popular in recent years, and the Maltese dog breed has proven to be a great addition to almost any household. Yes, the Maltese is famous for its looks. Their gorgeous, long, white coat makes even the most hardened person want to just carry it around on a pillow. However, the dog itself doesn’t care much for its beautiful exterior. The Maltese is an energetic, vigorous dog that wants to run around and play until it can play no more (which will take a while! ), and after that wants just to snuggle with you while you lovingly stroke her coat. The phrase “a dog’s life” does seem different when you look at it with a toy dog in mind, doesn’t it? A Maltese is an excellent companion dog and friend. They make a great therapy dog, as well as a sports dog for a lot of disciplines such as agility, obedience, tracking or rally. A sweet and loving dog that’s highly devoted to its owner and family, the Maltese is a perfect choice for a lot of people. Despite her energetic nature, the Maltese is so small that an apartment can suit it just fine. It also sheds very little, despite its impressive coat, so that’s not a problem in an apartment or a condo either. The main reason for this lack of shedding is because the Maltese dog breed does not have an undercoat. And, being so devoted to the people around it, as well as to its surroundings, the Maltese is a great watch dog. While they may notify you with a bark, the Maltese won't be able to do very much to guard your property. The Maltese is also intelligent and sweet, which makes it an excellent dog for training and tricks. These dogs are a good match for first time pet owners and will also fit in well with families with young children. Of course, no dog is perfect. As it often happens with other breeds as well, the Maltese is such a loving and affectionate dog and has a long history as a companion dog, that leaving them alone in the house can lead to some unwanted consequences. Generally, leaving your Maltese too often for too long (“too long” for a Maltese, being several hours) can make the dog anxious and stressed out. Especially in an apartment with noisy neighbors, the Maltese dog breed easily gets into the habit of barking at every noise and movement. Plus, the Maltese gets so attached to its owner that it doesn’t always play well with other pets or even small children. That’s especially valid if the Maltese has been a lone pet for a long time beforehand. Proper socializing can prevent that, so a good owner shouldn’t have many problems in this regard. In short – if you’re not ready to give your dog a ton of attention and time, the Maltese might not be for you. Otherwise – keep reading! Unlike a lot of other toy dogs, the Maltese is actually a really old breed. So old that it deserves the term “ancient”. In fact, the initial origins of the Maltese dog breed in Europe are still unknown. It’s called “Maltese” because researchers have traced it's origins back to the island of Malta in the Mediterranean sea, close to Spain and France. Before that, it’s believed to have come from Asia and the Tibetan Terrier breed, through the Middle East and North Africa, together with the migration of nomadic tribes. Another theory is that the Maltese came from a Spitz-type dog from the Swiss Lake Dwellers and was purposely bred for its small size. However, more research needs to be done in order to prove this theory. Before it was finally called the “Maltese” from The Kennel Club in the 19th century, the breed was known through a lot of different names, some of which are still used. Originally, it was known as the “Canis Melitaeus” in Latin. Other names include the “ancient dog of Malta” (or “Ye Ancient Dogge of Malta,”), the “Roman Ladies' Dog”, the “Maltese Lion Dog”, and “Melita” or the “Melitae Dog”, (the former name of Malta). Let us not forget about the “Maltese Lion Dog”, and the “Maltese Terrier”. The breed has also been called “The Comforter”. As weird as this might sound, the name is quite logical. People both in Europe and in ancient Egypt believed that the breed had the ability to cure people’s diseases. That’s why it was common for people to put Maltese dogs on ill people’s pillows. Another frequently heard name is “Bichon”, however, that is rather inaccurate. If you use this name to refer to the Maltese dog breed, you're actually referring to a number of small breeds. The Bichon name refers to the entire family of small long-haired dogs and not the breed in particular. Whatever its origins, before the Maltese became sought for its appearance, it’s believed to have been a rodent-hunting dog. Whoever it was that decided that the breed was too gorgeous for rat-hunting, must have lived a long time ago, since all historical evidence that we currently have for the Maltese is as a domestic dog. The earliest record of the breed has been found on a Greek amphora in the Etruscan town of Vulci. On this amphora, a Maltese-like dog is portrayed along with the word Μελιταιε (Melitaie). It’s dated around 500 BC! Regardless of their ancient origins, the Maltese found themselves in France in the 15th century as treasured pets of the French aristocracy. Later, during the reign of Henry VIII, the Maltese dog breed became introduced in Britain as well. It won’t come as a surprise to anyone that these dogs soon became favorites there as well. Queen Elizabeth I, Mary Queen of Scots and Queen Victoria, all have numerous portraits with these small, beautiful dogs. Not everything was roses and peaches for the small dogs, however. After surviving a probable intercontinental journey, the fall of the Roman Empire, the Plague, as well as the Dark Ages, the Maltese were nearly wiped out in the 17th and the 18th centuries by none other than the dog breeders. The breed had become so popular at the time, that people (naturally) decided that it would be great if the dogs were even smaller. After this disaster of an attempt, breeders had to mix poodles, East Asian miniature dogs and miniature Spaniels to the Maltese in order to save it. Fortunately, it worked, however, it also changed the breed into several different varieties. In other words, whatever the ancient origins of the Maltese are, the breed as we know it today came from the hard preservation work of English dog breeders. Since then, the breed was introduced to the U.S. (in the early 1800's) and took part in the earliest Westminster Kennel Club shows in the 1870's. The number of Maltese has been growing ever since, with it being one of the most popular breeds among toy dogs, as well as one of the most frequently winning breed in various toy dog competitions. Bred to be the perfect cuddly companion dog, the Maltese excels at this task. Lively, playful and loving, the Maltese is known for accepting anyone as a friend – whether human or animal. Being both a highly intelligent animal and a sprightly little bundle of joy, the Maltese is easy to train and eager to learn new things and tricks, especially through positive reinforcement. Give the Maltese enough love and attention, as well as the right treats and praise, and it will soon outsmart your neighbors. As with all other dogs, a Maltese’s personality and temperament is affected by three main factors – heredity, training, and socialization. When choosing a Maltese puppy always go to a trustworthy dog breeder. Not only for the sake of its health (which we’ll go into below), but also to make sure that the parents and the litter have been properly taken care of. Always try and choose a puppy that’s neither too active and dominating towards its siblings, nor a small, outcast one. The middle ground is where you’ll find the best all-rounded dog. Also make sure to get to know its parents, or at least its mother. Like with people, puppies take a huge part of their temperament from their parents. As we mentioned, positive reinforcement does wonders with the Maltese dog breed. They are more than smart enough to understand a vast array of signals, tricks, and ideas, as long as they are presented to them in the right way. A Maltese dog is so people-oriented and so attached to its owner, that if you treat it badly you can easily break this bond and cripple the dog emotionally. Being close to your Maltese dog and not leaving it alone for long periods of time is also crucial, since they can’t stand to be alone. Most dogs are social and require a good deal of socialization, but the Maltese makes most other breeds look like a bunch of anti-social introverts. Maltese dogs will greet everyone and everything with enthusiasm and thrive best in an active, social environment. That’s why it’s really important to socialize your dog from its earliest days through the rest of its life. Fortunately, they are a very small breed, so bringing them along with you is rarely a problem. The Maltese are a relatively healthy breed compared to other dogs, which makes them a good choice for people who are scared of the notion that “all modern breeds are too sickly!” Still, even a Maltese is not immune to illness and there are certain diseases that you should be on the lookout if you want your doggie to have a long and happy life. None of those conditions is guaranteed, and your dog might very well live problem-free. But, as a good and responsible owner, you owe it to yourself and the dog to make sure. For starters, always make sure to find a good dog breeder. If a dog breeder can’t offer you health clearances for both of the puppy’s parents, then no matter how much you’ve liked a certain puppy, it’s best to move on to another breeder. Consult with associations, such as the American Kennel Club, beforehand, in order to make sure that you’ve found a proper dog breeder. With Maltese puppies you should require health clearances from the from Auburn University for Thrombopathia; from the Orthopedic Foundation for Animals (OFA) for hip dysplasia, elbow dysplasia, hypothyroidism, and von Willebrand's disease; as well as from the Canine Eye Registry Foundation (CERF) certifying that eyes are normal. Additionally, the American Maltese Association participates in the Canine Health Information Center, which is a health database. Keep in mind that before individual Maltese dogs can be issued a CHIC number, breeders must submit evaluations from the Orthopedic Foundation for Animals and the Canine Eye Registration Foundation. Additionally, the lack of an undercoat has its health effects as well. Maltese are prone to getting cold either in cold weather or in cold water, so you have to keep an eye on that. Also, that same lack of undercoat results in a thin strip of naked skin on their back, which can result in a sunburn. The care for a dog’s coat is one of the most annoying part for some dog owners, and the most exciting one for others. Regardless of how you feel about it, it’s a necessity if you want your dog to feel and look good. A Maltese’s glorious coat has an obvious need for extra care. However, a lot of owners bypass this issue by simply giving their Maltese a puppy cut – a 1-2 inch (2.5-5 cm) trim all around their body, which pretty much turns their Maltese in a puppy. If you’ve gotten your Maltese for its joyful and playful personality more so than for its majestic looks, that’s certainly a good option. Other owners, those that love the long, beautiful coat of a Maltese dog, usually use wraps to keep the fur from matting and breaking off. Regardless of which of the two options above you choose, daily cleaning is still pretty much advisable, together with a weekly bath and a monthly grooming. As for other physical care – due to their proneness for tear straining, it’s advisable to clean their eyes daily with warm water. Washing your Maltese’s beard and its teeth is also a good idea if you want its mouth hygiene to be up to par. Aside from their coats, the Maltese have other needs as well. Since they are a very active and playful breed, they require a lot of exercise. In fact, they are active and lively even in their old age, so don’t expect your Maltese to “settle down”. Fortunately, due to their small size, they can get plenty of exercise inside the house. 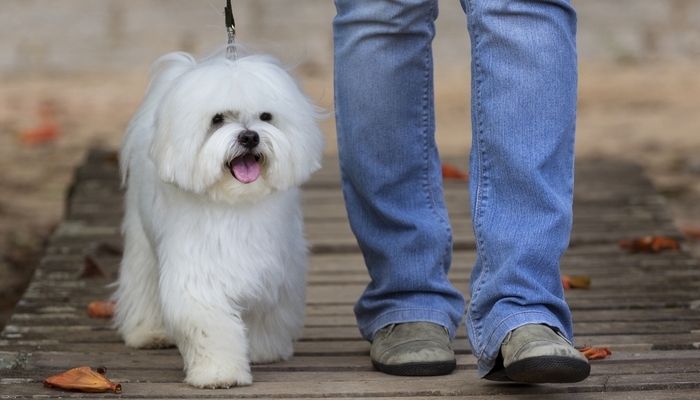 Of course, walking outside is strongly advisable, but since Maltese dogs get colds so easily, it’s not the worst idea in the world to keep them entirely indoors during the winter months, as long as you make sure that they get all the exercise there. Don’t go overboard with your dog’s exercise until she reaches about 8 months of age.Up to that age their bones are still developing. As a rule of thumb, go with your dog's needs and give her as much movement and activity as she seems to require. As much as kids love Maltese dogs, most dog breeders and trainers don’t advise parents of small children to get a Maltese. Yes, the dog would love the attention and playfulness of a toddler, but being a tiny dog, the Maltese can very easily get hurt. A small child can drop the dog, step on it, hold it with too strong of a grip, and hurt it in a myriad of different other ways. A Maltese is much better suited for a family with a bit older kids – at least several years of age – that can understand the importance of being careful with their dog. As far as other pets go, the Maltese is happy to socialize with all kinds of animals, as long as it’s either introduced to other pets from an early age or has been well socialized throughout the years. As with other small dog breeds, however, keep in mind that the Maltese dog breed has literally no concept for its miniature size and can get in trouble when trying to establish dominance over a much bigger dog. Maltese are not the most dominance-seeking dogs out there, but it’s still a risk. A Maltese dog can be a great pet for a lot of households. It is important, however, to know what you’re getting into beforehand – a Maltese dog requires a ton of attention, shouldn’t be left alone for prolonged periods of time, has to be housetrained and needs to be minded when around small children. If all those factors are not a problem for you, we can assure you that the Maltese dog breed will make your life much, much brighter! These little dogs have been popular for centuries, and now you know why.